It’s been very quiet here on the blog of late. My “blogging well” has felt dry as other life events have conspired to take my time, energy and attention away. 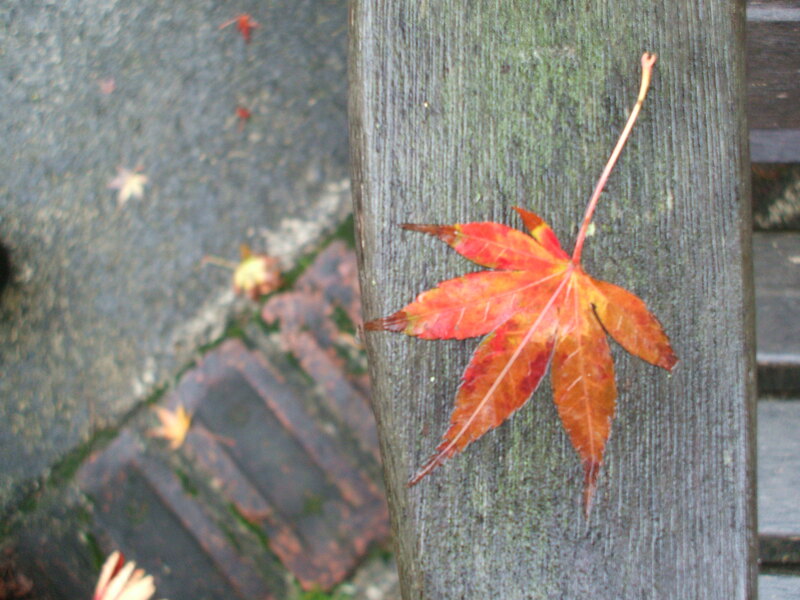 I spotted this Japanese maple leaf stuck on the arm of a very wet outdoor chair and it spoke to me of seasonal change, of flatness, of the effects of a dry spell. Its colourings are reminders that even in the natural cycles of ebb and flow, growth and decline there is a vibrancy that speaks of potential. This entry was posted in Uncategorized and tagged blog, blogging, drought, dry spells, Japanese maple leaf, New Zealand autumn, plants, seasonal change, trees on May 7, 2013 by ordinarygood. Sourced today from the blog of Valerie Davies. This entry was posted in Uncategorized and tagged blogging, blue sky dreaming, Dwight Eisenhower, inspiration, president dwight d eisenhower, Quotes, valerie davies on September 9, 2012 by ordinarygood. Please refer to my blogroll for some of my favourite blogs. Thanks again Zahra and go well with your blog. This entry was posted in Uncategorized and tagged awards, blog, blogging, genealogist, native birds, ordinary things, Very Inspiring Blogger Award on August 1, 2012 by ordinarygood. I’ve completed my annual bird survey today. The instructions were to record the largest number of each type of bird that was seen or heard at any one time – not the total number of each bird over the hour. That was a bit complicated but bird numbers were low in the garden today so it was not as arduous as I thought it might be. The common sparrow headed the list, followed by wax eyes, blackbirds, chaffinches, starlings, and goldfinches. I could hear a Tui over the road feasting on the red flowering gum trees so that was included too. I blogged about the 2011 bird survey here. I received an email late this afternoon telling me that a new website is being set up so that I can record any observations relating to nature but it will also be where future annual bird survey results will be loaded. I’m really pleased about that as there are times when I see a new bird in the garden and wish I could tell someone “official” about it. The other numbers I crunched today were on my blog. WordPress provides a raft of statistical data and I do check my stats regularly. This post will be number 308. My readers have posted 966 comments and I now have 70 blog followers. Thank you to all my readers. It is very gratifying to know that you enjoy my postings and continue to turn the pages on my blog. There is an interesting statistic amongst the people who regularly comment on my blog and that is that 4 of them have names beginning with the letter “J”. I also have a regular group of “likers” and it is always a pleasure to find your “Like” appearing in my notifications. 11 of my blog posts have been “shared” and that seems an extra honour and potentially widens my audience. Spam wins the day with 1,356 items that have been successfully thwarted at the cyber boundary of my blog and I am very grateful about that. I began blogging with so much trepidation but now it is almost a habit and I miss the days when I don’t post something. I began writing to satisfy an inner voice but having gathered followers I feel spurred on to provide something that I hope will interest you in some way. My photography interest is proving to be very satisfying to me and that has been a surprise too. Thank you again for reading, lurking, liking and commenting. You all enrich my days. This entry was posted in Uncategorized and tagged Annual bird survey 2012, birds, blackbirds, blog, blogging, chaffinches, conservation, environment, garden, goldfinches, nature, Nature Watch New Zealand, New Zealand annual bird survey, photography, readers, red flowering gum trees, spam, sparrows, starlings, statistics, sustainability, Tui, wax eyes, Wordpress, writing on July 6, 2012 by ordinarygood. No, I am not going to review the marvelous children’s story by Roald Dahl today. Instead I am going to write about how happy I am with the Mozilla Firefox browser I have just updated to. For the past few weeks I had been having increasing problems on WordPress.com. The font kept changing and rechanging, pages either would not open or would be only half open and there were several options that just would not operate for me at all. A notification from WP told me I needed to update my browser but I was uncertain about that advice. In part, this was because my laptop is gaining in years and with so many hackers and bugs and beetles around to infect computers I was unsure about where the problem lay. Today I took the leap and went from Internet Explorer to the Firefox system and things have shaped back in to good working order on WP and a few other website’s I was having strange moments with. So a nice move for now and WP is no longer causing me frustration and irritation. I’m glad about that. This entry was posted in Uncategorized and tagged blogging, children's books, Fantastic Mr Fox, fonts, Fox, internet browser, Internet Explorer, laptops, logos, Roald Dahl, Wordpress on July 2, 2012 by ordinarygood. Earlier in the year I blogged about a local man, Russell Plume who had used old pieces of brick that he had found on Plimmerton beach and in the local stream to form quotations from Shakespeare. He has made settings of these quotes and several are mounted on sea walls at Plimmerton Beach. Russell stumbled upon my blog during the week and left a welcome comment here.He has also set up a Facebook page called Shakespeare by the Sea, Plimmerton which includes photographic detail of how he constructed the pieces. He would welcome your interest. This entry was posted in Uncategorized and tagged beach quotes, blogging, bricks, Facebook, photography, Plimmerton Beach, Russell Plume, Shakespeare, shakespeare by the sea on April 22, 2012 by ordinarygood.